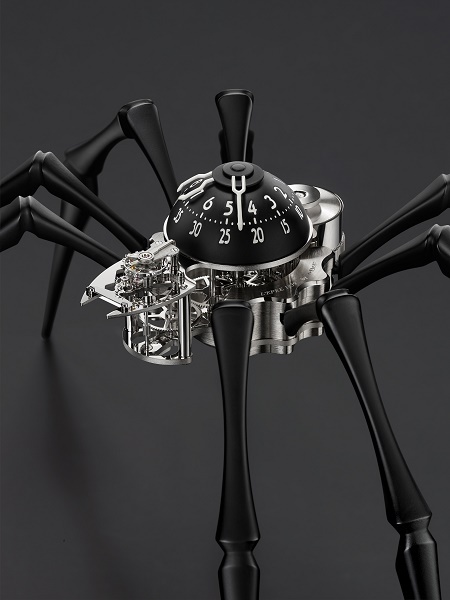 Conceived by MB&F and manufactured by L’Epée 1839 – Switzerland’s only specialised high-end clock manufacture – Arachnophobia is the result of MB&F founder Maximilian Büsser’s overactive imagination blending with his appreciation of art. 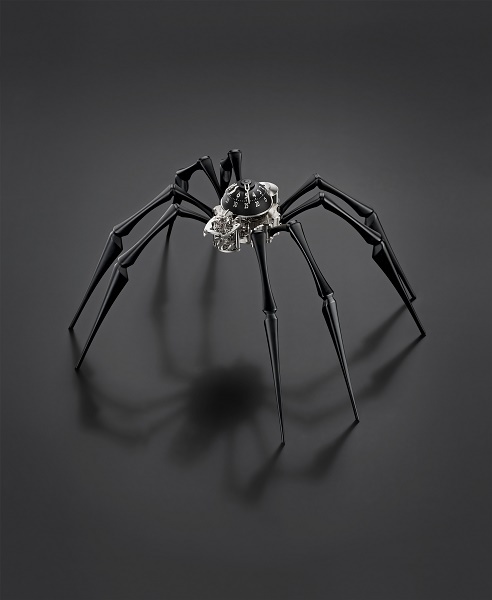 Arachnophobia was inspired by a giant spider sculpture called Maman (mother in French), created by Louise Bourgeois (1911 – 2010) in bronze, stainless steel and marble. Measuring 9.27 x 8.91 x 10.24 metres, the monumental sculpture has been installed in a variety of locations around the world. MB&F developed the highly unusual concept with L’Epée, selecting a high-end L’Epée clock movement and re-imagining it as the mechanical head and torso of a spider. The body is outfitted with a black dome with white numerals depicting the hours and minutes. The araneae’s self-sufficiency is to be admired, for the finely-finished, highly-visible movement boasts a power reserve of eight days. At either end of Arachnophobia’s time-displaying abdomen, important mechanical processes take place: the head houses the regulator with its oscillating balance wheel, while the other end contains the mainspring barrel, which powers the movement. Attached to the abdomen are eight visually enticing legs which can be rotated so that Arachnophobia can stand tall on a desk or on a wall. Arachnophobia is available in black or 18k yellow gold-plated editions. For over 175 years, L’Epée has been at the forefront of watch and clock making. Today, it is the only specialised manufacture in Switzerland dedicated to making high-end clocks. L’Epée was founded in 1839, initially to make music box and watch components, by Auguste L’Epée who set up the business near Besançon, France. The L’Epée hallmark was that all parts were made entirely by hand.